Take a look at the picture I posted. 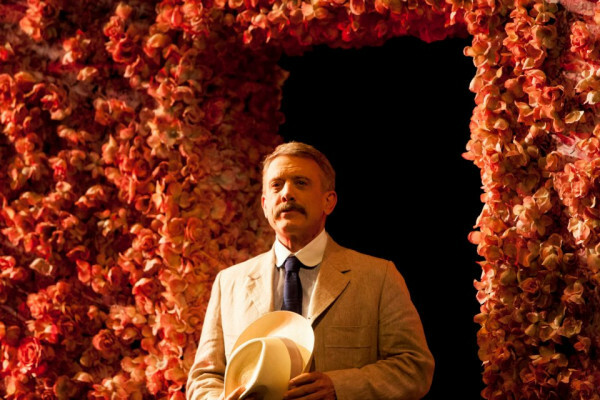 No, for once I don’t mean the gorgeous and talented man in it – look at the curtain: it’s made of roses, and to enhance that visual the theatre adds the scent of roses to it before each show. An enchanted hedgerow of pink and pale red blossoms, its thorns protecting the girl hidden inside – Sleeping Beauty comes to mind at the imagery. And an innocent Sleeping Beauty she is, Vivien Warren, who lives in this secluded garden. Her goal is to accumulate knowledge, and from this ivory tower of science she dreams of an intellectual life of financial security spent with friends. As it is her awakening will be a rude one. Up until now Viv has only been a mollycoddled spoiled child, with all the money she needed or wanted, and hasn’t seen much of her mother who has been travelling most of the time, keeping an eye on businesses unknown. Now that Viv’s studies are mostly finished, she is brought into the real world – and fails to deliver. Her mother wants to be friends and therefore invites her into the enchanted garden for a holiday – something Viv despises deeply – maybe because she doesn’t know what to do with life. To esase the strain of this first longer meeting mother Kitty Warren has invited a good friend, architect Mr Praed (Simon Burke), to join them. Also coming is her business associate Crofts. And indeed, Praed is the perfect ice breaker as he arrives prior to Mrs Warren and Crofts. Charming and charmed by Vivien’s unconventionality he eases her out of her shell by confiding that he is an “anarchist, I can’t abide the law.” But in doing so he still is trying to uphold the strict regulations society requires of him in his day and age – he fights for the “hard chair” and even though he loses he still has done what convention asks of him. Crofts – when he finally shows up, trailing Mrs Warren – is a man who knows his worth and his standing in society. He demands attention and is almost immediately drawn to the young woman. Secure in the knowledge of his wealth and position he decides to marry her – and thus asks Praed if he knows who Viv’s father is – after all, Mrs Warren has made this a secret to day. Finally enter Frank, who, with boyish charm and an immature, childish enthusiasm pursues Viv – with the best of intentions of course: As the young woman seems to have all the money she wants, he is definitely ready to marry her – in order to finally get out of his financial troubles his rather flippant lifestyle brings on. And thus the story unfolds. Mrs Warren, a lot more hands on and less lady-like than her educated daughter, demands her daughter’s love and respect, Crofts wants to marry Viv (as long as he isn’t her father) and reminds her that he won’t live forever. And Frank is adamant to defend his ticket out of his debts – even with a rifle, if need be. But it is Crofts who fires the parting shot: he re-introduces Viv and Frank – they are half siblings, the reverend apparently their father. With that the gorgeous hedgerow vanishes – Viv has been awakened to the circumstances of her mother’s life – a life she has benefitted her whole life from. And while she pragmatically and rationally understands that women might be in troubling circumstances that force them into a life they would not normally want to choose she cannot understand why her mother, settled and rich for years now, hadn’t abandoned the profession she had been forced into so many years ago. With all her education and her own dreams of independence she cannot comprehend that for her mother, staying in this business as a madame hads been the only way to be as independent as she wanted to be. And so Viv breaks with her former life – she no longer accepts her mother’s checks, she works for her living. And she has to accept that Frank is distancing himself from her: not because of her mother, he argues, but because she cannot support him and herself. And so Viv’s only friend stays Praed, the hapless romantic, always in search of beauty and art in everything. He will flit in and out of her life, a friend, nothing more, while she is alone. just as alone as her mother who wasn’t able to buy a daughter’s love with all the money she made. Now it’s no surprise that I really enjoyed Simon Burke’s portrayal of the helpless, hapless architect who means well, but fails to be of any help. Praed is a bit like the audience – partly in the know, but unable to stir the play into a different direction. His part has some funny one liners which he deadpans with brilliant timing, and his wide eyed surprise/shock is one of the highlights of the play. It is certainly credit to his huge talent that he commandeers the scenes he is in – with ease and elegance, I might add. Also brilliant in her part: Helen Thomson as Kitty Warren. Her immaculate lady with the shady present comes through when she tries to get a reaction out of her daughter, abandoning the high class dulcet tones in favor of a vulgar London brogue that has no place in society. Frank – Eamon Farren – is suitably young and charming and captures the good for nothing attitude with verve. He is the young version of Crofts – Martin Jacobs – who made his money by investing in shady dealings but still is able to hold his position in society. Both men have never worked a day in their lives and still are honored members of nobility. Frank’s “roman father” Drew Forsythe is every bit the comic relief as well as the center of the play. He succumbs to the sudden changes in his life with ungraceful embarrassement, which is incredibly funny to watch. The weakest link in the play is unfortunately young Lizzie Schebesta – Viv – who emphasizes the modernity of her character without realising the restrictions that still came with being a young woman in the 1900s. Her facial reactions and expressions are too “modern day” to translate well into a character of 1902, the year the play has been first brought onto a stage. She shows none of the trepidation a woman in her time would have certainly felt when all of a sudden plunged into a life dependent only on her own. Her “awakening” feels as if she’s made up her mind to move into a smaller apartment in the city, not as the decision to live alone from now on. This entry was posted in theatre and tagged architect Praed, G.B. Shaw, Helen Thomson, Mrs Warren's Profession, Simon Burke, sydney, Wharf Theatre. Bookmark the permalink.